I started this day off in Bethany, MO after chasing Kansas, Nebraska and Missouri the night before. I woke up late and quickly realized that I needed to hit the road right away if I wanted to get anything. I headed up I-35 to Des Moines, and then east towards Chicago. About the time I started crossing the Mississippi River, storms started to fire just to my east. I decided in Geneseo, IL that I needed to go up I-88, so I got off I-80 and headed up to I-88 and then over. Unfortunately, those cells pretty much fell apart for one reason or another, and now I was stuck on I-88. I started getting alerts on my phone a little further down for my home counties in Lansing. A nice supercell had erupted over the city, and dropped up to 1.5″ hail. The one report that really disappointed me was the TV station which is directly across I-96 from my apartment had hail up to 4 inches deep on the ground. I missed the best hail event in the area in years! The stuff up in Wisconsin had started to turn into a line of storms, so I decided the best approach would be to get around the lake and intercept as they came ashore. Driving through I-88 and I-294 just before rush hour was a pain, but I managed to get myself through and around the lake. I stopped at Michigan City for a gasup and quick food, and I was back on the road in less than 10 minutes. 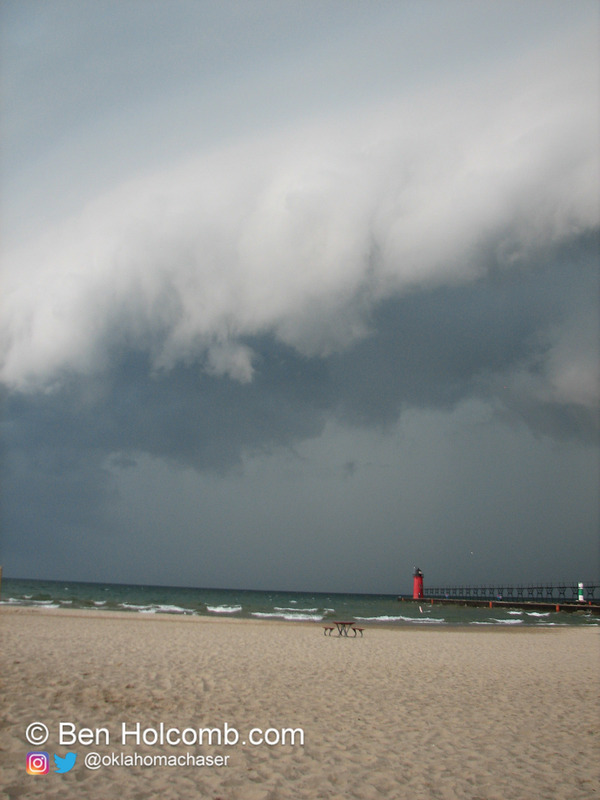 I flew up I-94 and I-196 to South Haven, where I parked and got some AMAZING shelf cloud pictures as the storm came ashore. The people playing volleyball on the beach continued to play as this was all going on, with multiple cloud to ground strikes over the water. After the shelf cloud came ashore, I tried to keep up with the line of storms, but was unable to catch back up. I eventually ended up giving up for the evening and heading home.